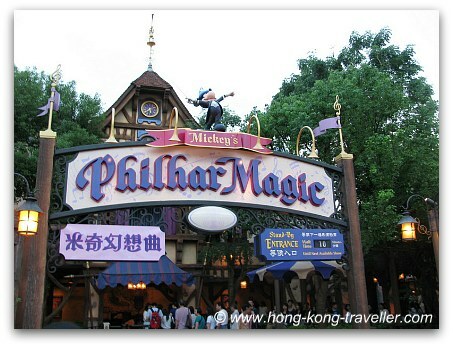 Fantasyland is at the heart of the Disney fairy tale magical moment experience. 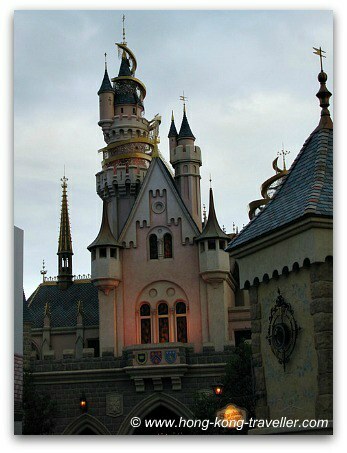 It features the most prominent Disney trademark, Sleeping Beauty's Castle and many of the classic fairy tale characters from everyone's childhood find their "homes" here: Cinderella, Dumbo, Winnie the Pooh, all have their own attractions, and the rest of the gang hangs out at the Fantasy Gardens, the meeting point for character greetings. Little children will enjoy this land, rides are mild and the grounds are ripe with little touches of Disney magic all around. Fantasyland occupies the space in the back of the park and is flanked by Adventureland on the left and Tomorrowland on the right. From the park entrance is a straight shoot to the back, you can just aim for the Castle to get there. 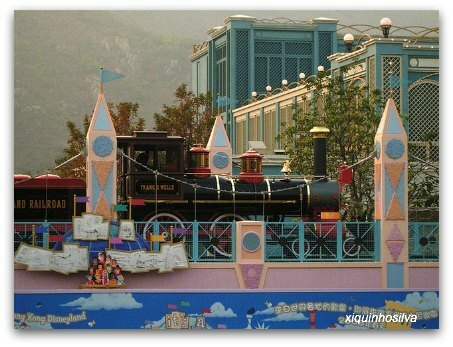 The Hong Kong Disneyland Railroad which circles the entire park, is a convenient way to get to this land from the Main Entrance. One of the two railroad stations of the park is found here. 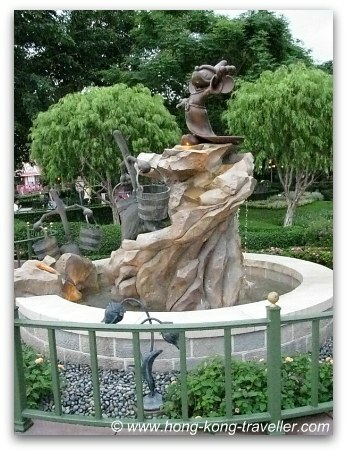 Fantasy Gardens: Meet your favourite Disney Characters here! 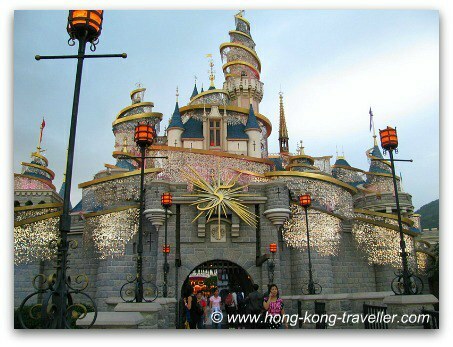 All roads lead to the castle at Disneyland Hong Kong, Sleeping Beauty Castle is in the center of the park. 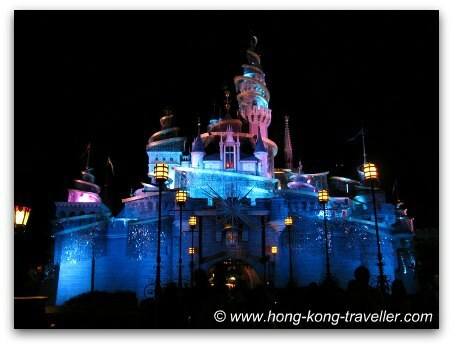 It is a replica of the original Disneyland Anaheim's own castle with the blue tower roofs and light pink walls. The Castle itself is the attraction, as there isn't much else here to do, except walk through it, and of course take beautiful pictures with Disney's iconic symbol. It also serves as the backdrop for the Disney in the Stars Fireworks every night. Speaking of night time, the Castle all lit up in the evening is a wonderful sight. 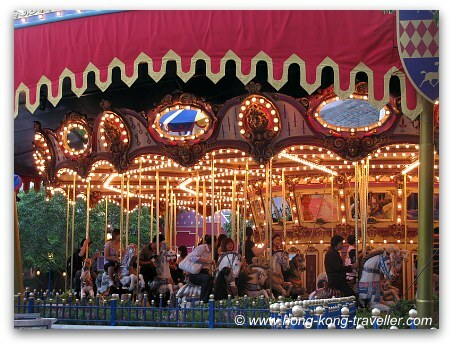 This is one of the classics, after all, what theme park wouldn't have a merry-go-round. You find the Carousel as soon as you go through the Castle. There are stationery horses as well as the ones that move up and down, and different sizes to accomodate all ages. 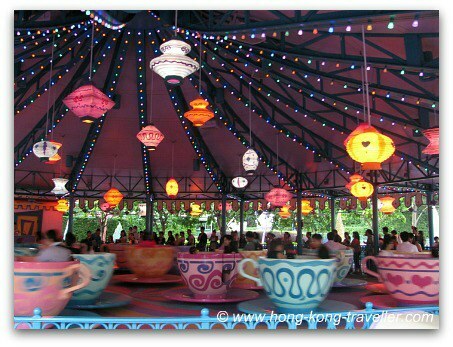 Welcome to Alice in Wonderland's "Happy Unbirthday" Tea Party, spinning Tea Cups and all! 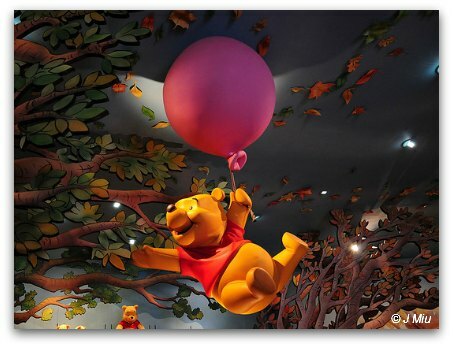 This ride will take you through the Hundred Acre Woods on a journey in search for that elusive honey pot. 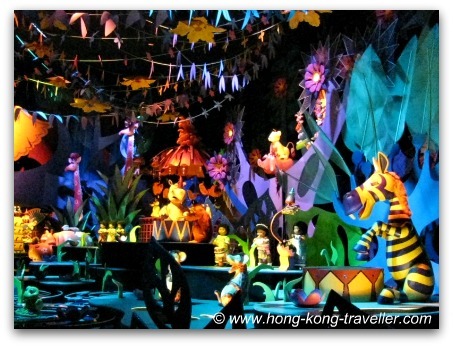 You meet Pooh and the rest of the clan, Tigger, Piglet, Eeyore, Kanga and Roo, Rabbit... they all make an appearance! Waiting times can be long at this popular ride, so check out the Disneyland Fastpass that can help you cut the waiting time to only a few minutes. 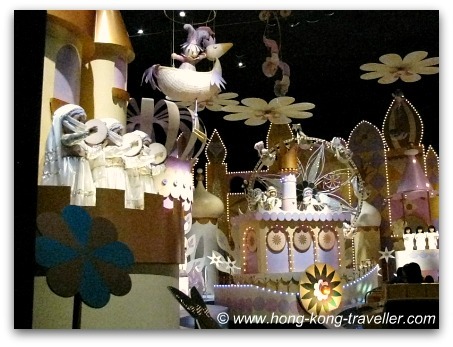 It's a Small World is a Disney classic, and at Disneyland Hong Kong, subtle Asian touches have been added. 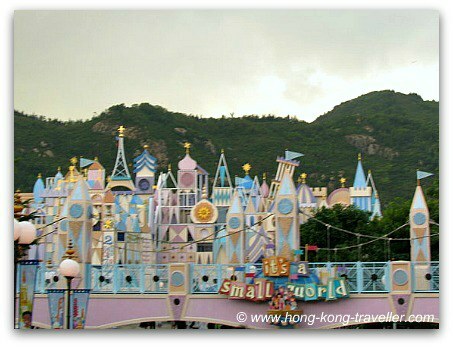 Small World is located beyond the railroad track circle. The Asian room is slightly larger and features a Chinese Lion and other aspects of Chinese culture. 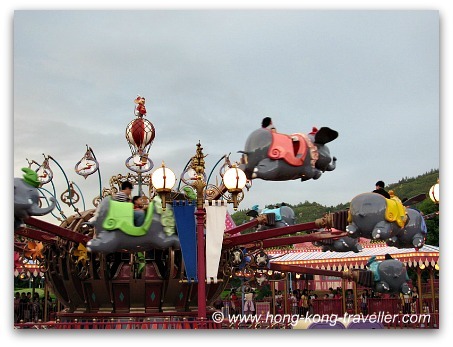 Also, a few Asian languages have been introduced to the theme song which adds to the local flavour: Cantonese, Mandarin, Tagalog and Korean are unique to this park. 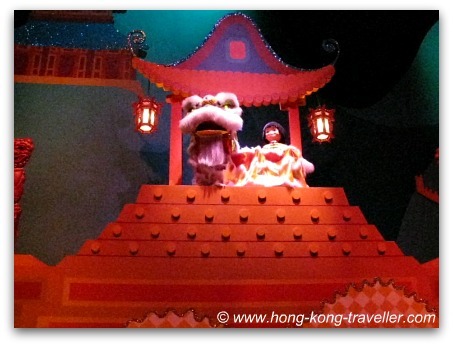 Another special feature is the introduction of Disney Characters into the attraction. There are 38 Disney characters, and they all blend in quite well with the existing figurines, they have all been placed in the continent of their origins. Look for Woody and Jessie at the American Western world, Mowgli and the Jungle Book characters in the African Continent, Mulan of course in China, etc. Of the 38 characters, see how many you can find! The only other Disney park to feature the characters is Disneyland Anaheim. The Golden Mickeys is a really good show, a tribute to Disney movies. 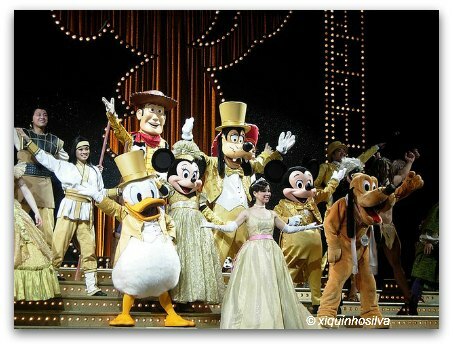 A cast of performers and Disney Characters in a lively multimedia show of singing, dancing, and acrobatics, featuring popular movies in Disney's version of the "Golden (Mickey) Globe Awards". Disney movies featured include Toy Story, Hunchback of Notre Dame, Tarzan, Mulan, Lilo and Stitch, the Little Mermaid, and Beauty and the Beast. You will see the regulars in the show as well, Mickey, Minnie, Pluto, Goofy and Donald adding a bit of their own humor. 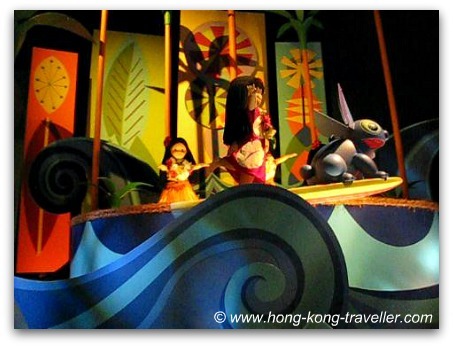 The show is in Cantonese, but don't let that keep you from it. All the songs are in English, and there are subtitles as well. Most importantly, the essence of the show and the fun atmosphere is quite universal. You will certainly enjoy this regardless of what language you speak. 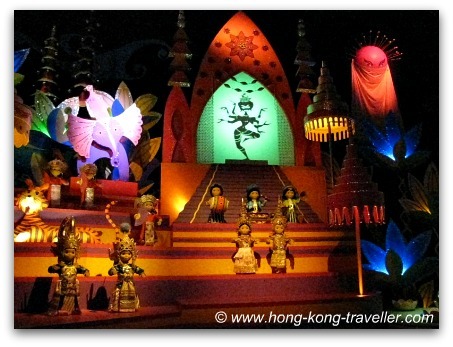 The Golden Mickeys Show is performed at the Storybook Theater next to Small World outside the railroad circle. Another show, this time a 4D movie animation, the extra dimension is for the added effects coming at you in all directions, and I'm not saying any more, you just have to watch it. These are beautifully landscaped gardens with touches of Disney magic here and there. But the main attraction is not the gardens themselves, but the gazebos where you get to meet your favourite Disney Characters. 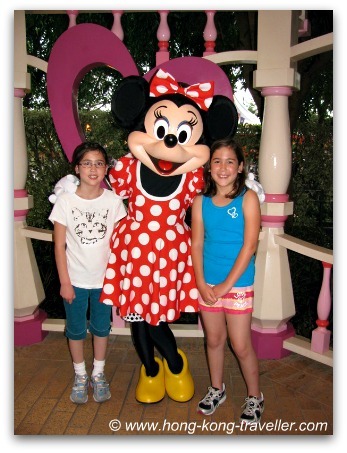 Mickey, Minnie and the whole clan will be there ready to greet and have pictures taken with you. There is even a Park Attendant that will take your picture with your own camera, and of course the "official" photographers that will try to sell you theirs as well. The line for Mickey is always long as can be expected! Another "sure bet" for meeting Disney Characters is the Buffet at Enchanted Gardens at the Disneyland Hotel, where Mickey and the Gang will come around the tables and say hi while you enjoy your Mickey-shaped pancakes or dim sum.